Over the past few months I have read time and again of my friends homes being ravaged by colds, flu and worse. November is traditionally a month of giving thanks, and I a beyond thankful for the health of my family. I have been blessed with a brood that rarely gets ill. I am hoping beyond hope that Emma will continue this tradition as she embarks on her first year of public school and exposure to new germs her friends are more than willing to share. The weather is turning and noses are beginning to run… the first sign of a winter cold. Remembering how blessed we are with our good health, it is important to remember to help others that may not be as fortunate. During cold and flu season, sharing a box of Kleenex tissues is the ultimate way to give a bit of comfort. Small gestures make a big difference. Being grateful doesn’t mean you have to go out of your way to display how you feel- the smallest of gifts make all the difference. I’m sure several of you have had the pleasure of experiencing a Halloween Booing. If not, the concept is simple… pick a recipient, fill a bag with small goodies they would enjoy and then leave their gift for them on their porch (my kids like to ding, dong, ditch after they put the bag down). Our family has taken this Halloween tradition through Thanksgiving and Christmas as well. During cold and flu season the goodie bag could contain a bag of soup mix, a box of Kleenex and a current gossip magazine. Kleenex is giving us the opportunity to make care complete with a Kleenex Brand Care Pack. All we have to do is visit a local retailer, purchase a specially marked Kleenex brand bundle pack and redeem the code on the box! 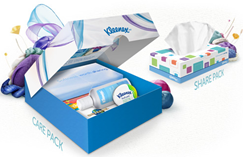 To redeem, simply visit Kleenex.com and follow the directions to send your Care Pack to someone that needs a little care. Check out Kleenex’s Facebook page for more information. Thanks so much for sharing. I’m going to visit the Kleenex Facebook page and share a care package. Okay tha is great! I bought the wrong one. I will have to get the right one this time. Thanks for sharing. I love this idea! I wish people around here did things like this. The only times Ive seen my neighbors was when we were hit by a terrible tornado last year. Its sad how we forget little gestures such as the one mentioned in your post mean so much to someone. I know if someone did that for me I was be very grateful! I remember one Christmas several years back my son & I both had the flu & didn’t even feel like opening presents. If someone had brought me something like the Kleenex Brand Care Pack to help me feel better then & let me know someone cared I would have cried! Its such a simple thing that could really make someones day. Thanks for sharing!